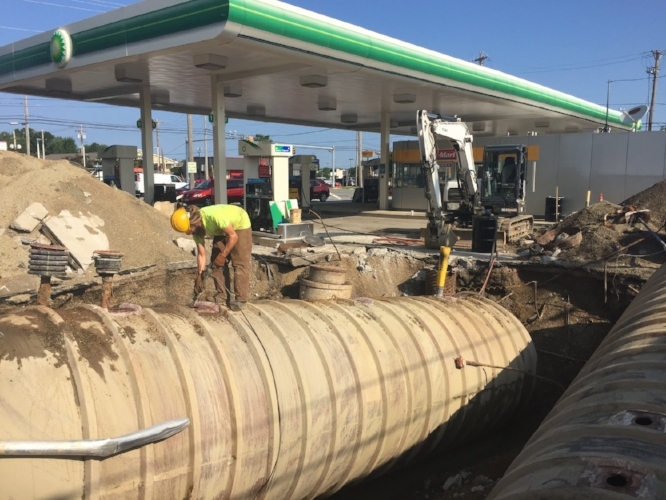 Underground Storage Tank Removal — Flynn Environmental, Inc.
Flynn Environmental is the leader in removing USTs in Northeast Ohio and Western Pennsylvania year after year. We have built our reputation one site at a time by providing the most efficient service through careful planning to avoid costly delays or surprises. Our written quotes and closure reports are very thorough and concise (and we rarely have any extras). Multi-site facility managers particularly appreciate that they need only make one call to Flynn Environmental for UST removals and building demolition to prepare sites for redevelopment. If contamination is encountered during UST removals, its source is carefully documented to assure the tank owner receives the maximum state UST insurance coverage through the PA Underground Storage Tank Indemnification Fund or the Ohio Petroleum UST Release Compensation Board. Flynn Environmental can transition seamlessly into performing a site characterization to delineate extensive contamination to resolve any issues as quickly as possible.